Wander around the millstone grit edges of the Peak District, and you’ll inevitably come across a millstone or two, left over from when this area produced these for the local (and not so local) mills. They make great subjects in an image. Half an hour before dawn and the light is very low, despite the first signs of the rising sun. In these conditions a tripod is essential. You’ll also need some neutral density filters as the sky, relatively dark though it is, is still much brighter than the land (which is in deep shadow). So the sky still needs holding back in order to get the exposure right. This early in the morning, don’t forget your head torch, an essential item for the low light photographer. Photography stuff: 12-24mm lens at 12mm, 25 seconds at f/9.0, 3 strop hard graduated nd filter to hold back the sky, tripod, remote release, ISO set to 200 in order to get the exposure below 30 seconds. 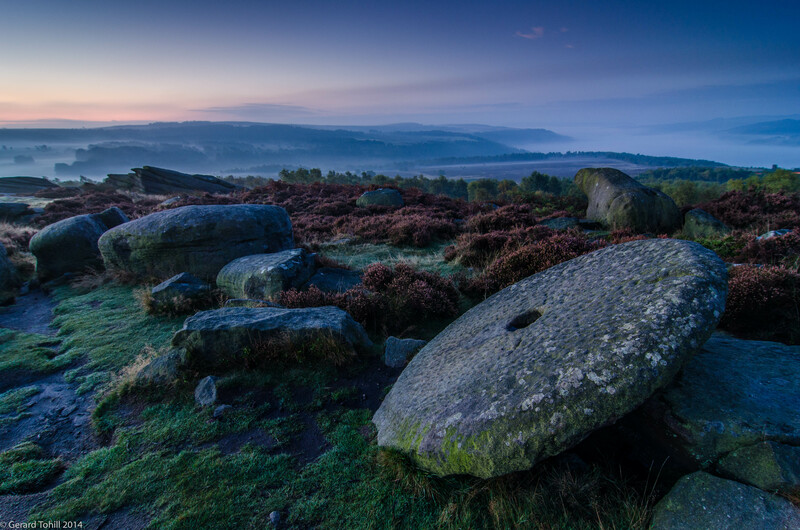 It is amazing to see the millstone just lying out in the landscape. I love the shot, history and nature! Also, that’s a great idea about using the headlamp. A very nice image. It appears that it is getting colder there. Also, thank you for the additional information.